Simple 5-Minute Homemade Green Bloody Mary Mix makes a unique cocktail base. 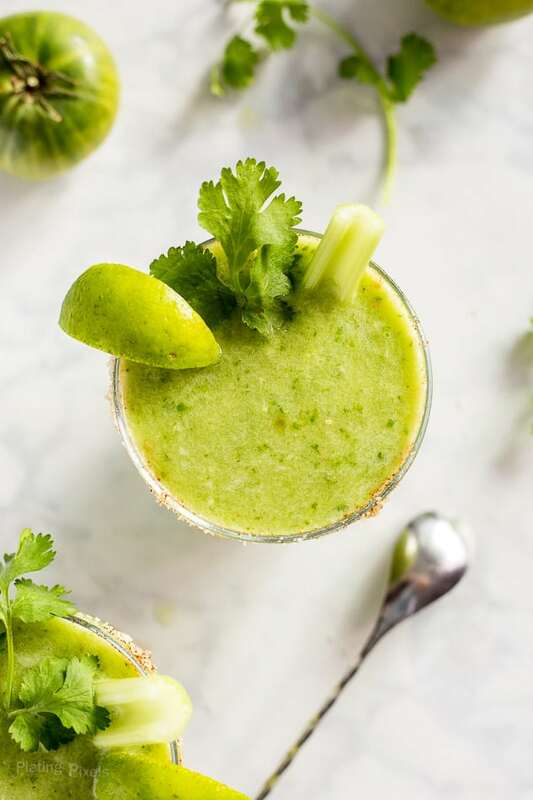 Just blend together green tomatoes, tomatillos, celery, cilantro, green hot sauce and spices. Bloody Marys may just be a favorite cocktail of mine, or at least a very close second to homemade gin and tonics. They’re perfect for almost any occasion, including brunch! There’s plenty of varieties, whether store-bought or homemade. For a unique variation, try this 5-Minute Homemade Green Bloody Mary Mix. 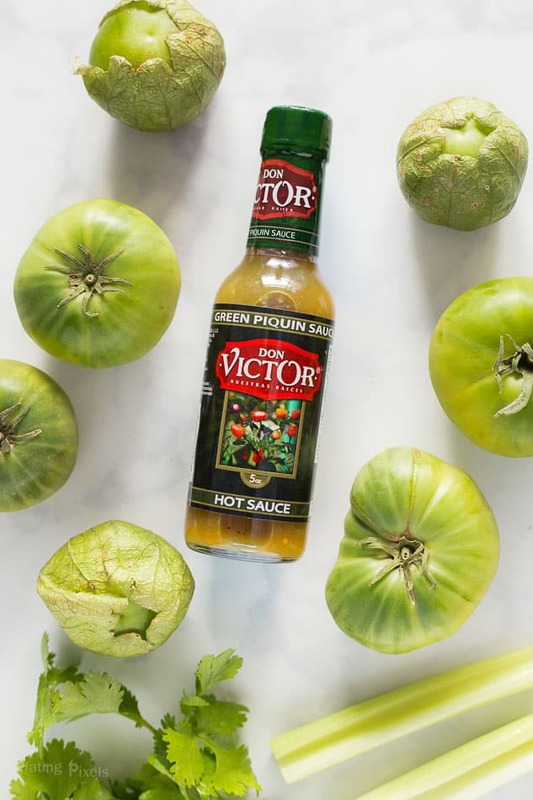 With ingredients like organic heirloom green tomatoes, tomatillos, celery, cilantro and green hot sauce, it can be enjoyed without alcohol. 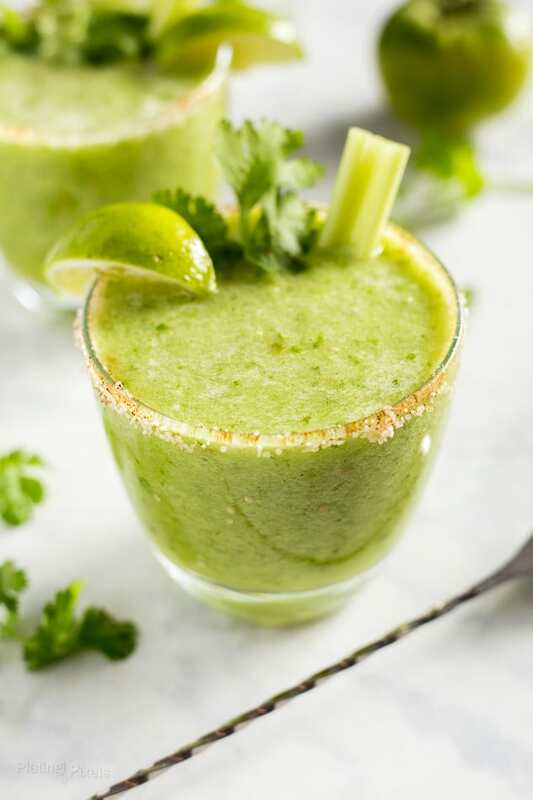 Basically this is a green smoothie with plenty of nutrients, flavor and the perfect amount of spice. Simply add all ingredients, blend and serve, all in less than 5-minutes. If you prefer, just add your favorite vodka to make it a green Bloody Mary. Don Victor Green Piquin Hot Sauce is recommended for this recipe. This green piquin pepper sauce, made from immature green piquin peppers, lends plenty of distinct mild heat. The piquin pepper is a very small pepper from northern Mexico. For those that want to slightly embolden their dishes, this green piquin sauce is just the flavor you’ve been searching for. The ingredients include roasted green piquin peppers, pumpkin pulp, water, apple cider vinegar, garlic and salt. Use ripe heirloom green tomatoes, preferably organic. This will lend a majority of flavor to the mix. You can substitute yellow tomatoes depending on availability. Tomatillos don’t need to be cooked, just blend them in. Add more or less hot sauce to create the desired amount of heat. Substitute ingredients or modify the mix to your liking. Add things like lime juice, green onion, jalapeno, chili powder or other spices. 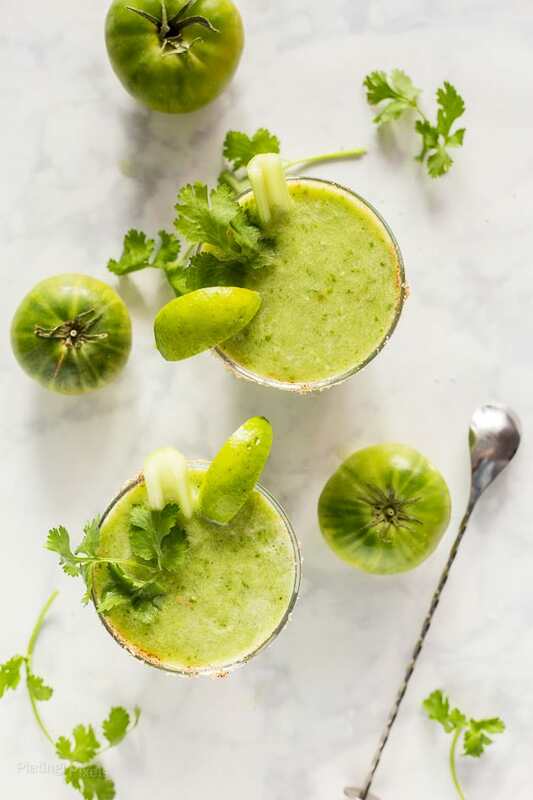 Cut tomatillos and tomatoes into quarters and place in a blender. Add water, celery, cilantro, hot sauce, Worcestershire sauce, cumin, black pepper and salt. Blend until well pureed. Consistency should be liquid with some pulp; use more or less water if needed. Chill until ready to serve or prepare immediately. Stir together kosher salt and chili powder in a small rimmed dish. Rub lime wedge around edge of serving glasses and dip into salt mixture. Drink as a virgin homemade green bloody mary mix in prepared glasses, or add desired amount of vodka and ice to make a cocktail. Optional: garnish with celery, olives, lime or other veggies. How many tomatillos and tomatoes go into this? Hi Kerri. I apologize for that, recently change my recipe plugin and looks like this didn’t translate over properly. It’s all fixed and thanks for the comment! I love fried green tomatoes, that’s the only thing I ever thought of for green tomatoes! This great idea for Bloody Mary!! Looks great! I am such a fan of tomatillos, but have never had them in a Bloody Mary! What a great idea. Can’t wait to add this to my drink menu for brunch. Oh wow this looks incredible! I have never thought to try a green Bloody Mary! Love this vibrant green color! Definitely a fun way to switch up your Bloody Mary!